REVELL ACQUIRED THE RENWAL name and most of its tooling in 1976. A number of kits have been re-released, the latest being the M-50 Ontos, which uses the original Renwal logo, box-style, and Blueprint Models series title. Mat Irvine: Several Renwal 1:32 scale Blueprint Models have already appeared, the name emphasising that they were scaled from ‘official blueprints.’ They have been released under the watchful eye of Revell’s Product Manager Ed Sexton, who was keen to reintroduce the Renwal name and Blueprint title. The Atomic Cannon, Twin Forty, Teracruzer and Mace Missile have already been released, and now the M-50 Ontos joins the lineup. 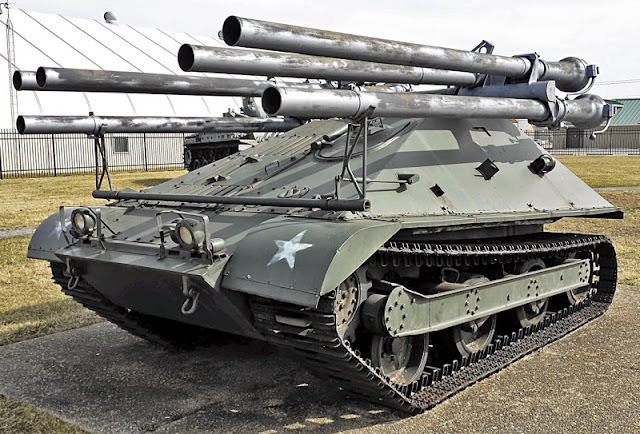 The Ontos is a strange-looking military vehicle, perhaps reflected in its name, the Greek word for ‘Thing.’ It was designed as an anti-tank weapon, armed with two sets of three launchers, in effect six M-40 106 mm recoilless rifles, mounted on a relatively small tracked chassis. There are 108 parts (below) in the box, including three crew. The kit is moulded in olive-green styrene, with two black vinyl tracks. The kit is straightforward to assemble. You have to decide if you want to paint the interior white (below) perhaps an odd colour for an AFV, but in fact quite usual. You need to do this before the main assembly, masking off appropriately if you are painting the exterior. If you build the Ontos with all hatches shut, there’s no point in getting out the white paint, of course. The kit supplies a spare load of ammunition (below). These fit in a compartment under the floor at the rear. Overall US Army olive drab is one of the choices for finish, though some survivors on display show the launch tubes in a metallic magnesium/aluminium shade, the alternative I used here. The model’s upper hatch opens, as does the driver hatch and the double-doors at the rear. The tubes can elevate, and the turret to which they are attached rotates. The crew of three can be placed in the Ontos, or stood in suitable positions around it. 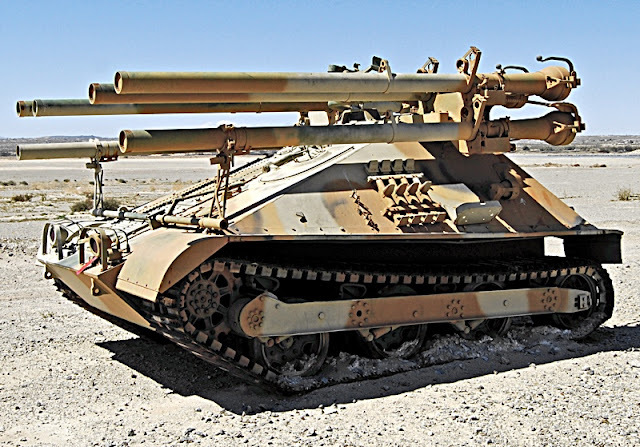 The Ontos (above, below) with launch tubes in magnesium finish, rather than the olive-green seen in many photos. The silver look supplies some attractive contrast. The Ontos (below) mounted on a scratch-built diorama base. The oil drums and signs came from an Italeri accessory set. And just to compare, the original instructions (below right) compared with those of the new release (left). The older set is actually from a Frog De Luxe issue that was intended for UK release. Apart from the logo, the instruction sheet was identical to the Renwal equivalent. The Ontos was initially developed for the US Army, although it did not put the weapon into service. Instead, the US Marine Corps took it over, choosing the Ontos for its manoeuvrability and light weight. Although effective when it first fired, the M-50 did have an overriding problem in that the crew had to leave the vehicle to reload the tubes, perhaps not ideal on the battlefield. A couple of options for Ontos finishes (below) indicate that a bit of research can result in some interesting choices. Plenty of interesting Renwal stuff at SMN here. Academy 1:35 scale kit here.